1. EDWARD ALEXANDER4 HESSKEW (WILLIAM ALEXANDER3, MOSES2 HASSKEW, U1) was born February 27, 1858 in Gonzales County, Texas, and died February 20, 1939 in Bexar County Texas. 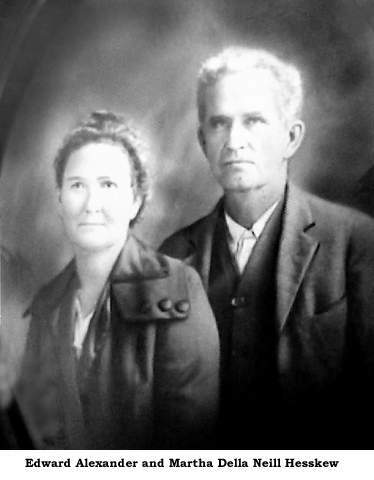 He married MARTHA DELLA NEILL November 19, 1889 in Atascosa County, Texas, daughter of SAMUEL NEILL and MARTHA BELL. She was born December 28, 1870 in Atascosa County, Texas, and died September 15, 1958.
i. ELLA D.5 HESSKEW, b. January 05, 1892, Atascosa County, Texas; d. July 18, 1977, Atascosa Co. , Texas; m. GEORGE M DAVIS, April 30, 1917, Atascosa County, Texas; b. February 14, 1885; d. January 16, 1958.
ii. IRA LEE HESKEW, b. March 18, 1894, Atascosa County, Texas; d. December 11, 1962; m. VALERA MABLE HILL, Abt. 1916; b. April 08, 1900; d. January 18, 1996.
iii. 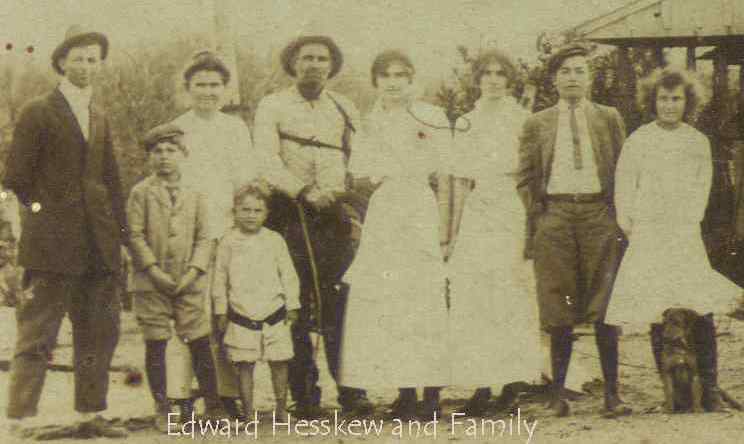 EDNA HESSKEW, b. January 18, 1896, Atascosa County, Texas; d. March 14, 1935; m. FRANK SAMMONS; b. Abt. 1890.
iv. EDWARD DEE HESSKEW, b. January 06, 1900, Atascosa County, Texas; d. February 08, 1980, Atascosa County, Texas. v. ORA ODETTA D. HESSKEW, b. July 01, 1901, Atascosa County, Texas; d. January 05, 1983, Atascosa County, Texas; m. HERMAN CANNON, Abt. 1920; b. July 02, 1896; d. April 27, 1981.
vi. WILLIAM SAM HESSKEW, b. June 10, 1905, Atascosa County, Texas; d. October 20, 1950, Bexar County Texas. vii. ALTON CLIFTON HESKEW, b. February 10, 1910, Texas; d. 1965, Texas; m. (1) BERNICE; m. (2) EUNICE SHEPPERD, San Antonio, Texas; m. (3) MAXINE. viii. INFANT SON HESSKEW, b. Abt. 1903; d. 1903, Atascosa County, Texas.